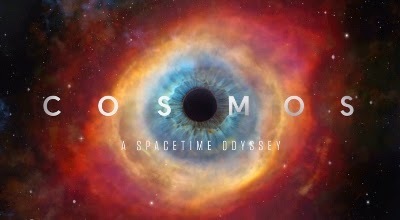 Some of you may have heard of Cosmos: A Spacetime Odyssey, a recent remake of Carl Sagan's popular PBS science series from 1980 hosted by Carl's protege, Neil deGrasse Tyson. It's literally the best thing I've ever seen on TV (or a screen of any kind - thank you Michael Faraday!) I consider myself fairly well read when it comes to science and technology (and space! Heck, I even earned my Astronomy merit badge as a Boy Scout many years ago). But with each passing episode of Cosmos, not only have I learned multiple new concepts, but I'm often left with tears in my eyes at the simplicity and power of the ideas, as well as the emphasis on openness and accessibility of knowledge. Despite my man-tears, the best part of Cosmos for me is that I've been able to share it with my two 8 year old daughters, Miriam and Catherine. We've watched the first 10 episodes together, and they can't wait until we can sit down again to watch the next episode. In their minds, Cosmos > Scooby Doo, and that's saying something. I just wanted to take a moment to thank you for your work to popularize science in so many ways. In particular, one of my daughters, Miriam, has immensely enjoyed watching Cosmos. Miriam is 8 years old and is on the Autism spectrum, although fairly high functioning. Earlier today Miriam was asking me questions like, "How fast is the fastest race car?" I responded, "About 300mph." Then she asked, "How fast is the speed of light." "670 million mph," I replied. She then proceeded to write out those numbers and subtract one from the other, getting answers like 669,999,700. I asked her what she was doing, and she said, "I want to be a genius like Newton. Do you have any of his books?" My jaw just about dropped to the floor, then my wife and I looked at each other and started laughing in disbelief. Of course, she was completely serious. I told her I'd find one of Newton's books for her. Because I wasn't fast enough (this was literally just a few hours ago), she found my 3-inch thick AP Chemistry textbook (it's been laying on a bookshelf for years) and after a brief scan of the table of contents, immediately started reading the chapter on "Electrochemistry" (probably because we had just finished watching the Faraday episode earlier today). So congratulations! You've just made Sir Isaac Newton my 8 year old Autistic daughter's role model. Mission accomplished, sir! Dr. Tyson (and the rest of the Cosmos team), thank you for sharing your love of science and knowledge. If nothing else, you've at least touched the life of an 8 year old little girl (and her father).